Dual Phase Extraction (DPE) is a process of combining Soil Vapor Extraction (SVE) with groundwater depression. The process is sometimes referred to as DPE two pump or Mobile Dual Phase Extraction (MDPE), with the internal combustion engine and vacuum pump creating the induced well vacuum, and an in-well pump creating the groundwater depression and induced hydraulic gradient. During the process of increasing the SVE induced vacuum in an extraction well screened across the static groundwater level, the groundwater will rise in the extraction well reducing the available well screen area. Also, if Non-Aqueous Petroleum Liquids (NAPL) are present in the extraction well, the rising groundwater will result in decreasing the NAPL thickness. DPE two pump is a methodology whereby high vacuums can be induced in the capillary fringe (smear zone) and below zones without raising the groundwater level in the extraction well over these exposed zones. Unlike DPE using a "stinger" or drop tube, the groundwater depression is the result of an in-well pump that will create a deep enough depression to overcome the groundwater rising effect as a result of high induced vacuums (up to 320"H20, 23.5”Hg). A specially designed well manifold is required to allow the pump cord and discharge lines to enter the well without the loss of induced vacuum. A level monitor (data logger) is not required, but is highly recommended and extremely useful in determining the level of groundwater depression. AcuVac can provide a data logger in the extraction well. The recovered groundwater/NAPL is pumped through a volume meter and collected in a standby tank or truck. The total induced vacuum is directed to SVE as compared to the DPE stinger or drop tube process where a substantial percentage of the total induced vacuum is used to raise the groundwater/NAPL through the drop tube. This can substantially reduce the induced vacuum in the exposed screened area. Vacuum and groundwater flow can be independently controlled. This provides substantially higher quality data recorded from the outer observation wells. Generally, a higher percentage of NAPL recovery is also accomplished. In addition, non-diluted vapor samples can be taken from the influent vapors. The DPE technology can be used in conjunction with a Pilot Test where the vacuum radius of influence and the induced hydraulic gradient are calculated or with the pump out event program. The DPE technology has also been very effective in recovering crude oil. Soil Vapor Extraction (SVE) is also referred to as Soil Venting, Soil Vacuum Extraction and In-Situ Vapor Extraction. The technology is not new but the methodology can vary greatly, depending on the sub-surface permeability, depth to groundwater, ground cover and SVE equipment. SVE is a simplified process of removing contaminants from soil and, under certain conditions, can be a very effective methodology. Using SVE at sites with suitable conditions can reduce cleanup costs. These conditions include high soil permeability and VOC properties, that is, the higher the vapor pressure of the compound (gasoline, natural gas condensate), the greater the amount of VOC that can be removed per volume of air. System pressure (vacuum), air flow rate and temperature also affect the volatility. SVE is not a treatment system in itself. Rather, it is a means of bringing the contaminant to the surface for treatment. SVE transfers the contaminant to the air stream and brings it to the surface as a vapor, free of the soil. This allows simplified and less costly treatment methods, including using the vapors as the primary fuel source for an internal combustion engine. Three catalytic converters treat the exhaust gases to meet air quality standards. A Quick Test (QT) is a short SVE Test of 0.5 to 1.0 hours conducted from existing Monitoring or observation wells located on-site and off-site. The test provides background data on the soil vapor plume area, which may not totally conform to the groundwater plume. Each QT provides well vacuum and flow and from a soil gas sample (influent vapor) the HORIBA Analyzer can provide total petroleum hydrocarbons in ppmv and the percent of CO2, and CO. Additional instrumentation provides O2 and H2S data. The depth to groundwater and depth to NAPL are also recorded. This informative data is very helpful prior to starting an SVE or DPE test as it confirms whether or not the outer wells are within the vapor plume area and are functional. Many Project Managers are able to plot a vapor plume site map from this data. AcuVac pioneered the SVE Quick Tests over 20 years ago and now many Pilot Tests include QTs. Air Sparging is also referred to as Sparging, Air Injection and In-Situ Air Injection. In recent years, there have been both laboratory and field testing published reports on tests conducted in various soils, that have verified the effectiveness of air sparging. Pilot Tests/Feasibility Studies provide data on the common indicators for projection of the Air Sparging radius of influence. Such indicators as, increase in dissolved oxygen content, pressure gradients observed in outer observation wells, water table mounding and observed bubbling in adjacent wells, provide the best indirect indication of actual airflow. AcuVac experiences the above conditions when providing Air Sparging testing and operations. To measure and accurately record the dissolved oxygen content, AcuVac uses the YSI Optical dissolved oxygen meter with groundwater depths up to 100 meters. The results have been extremely effective in supplementing the other recorded data for the calculation and projection of an Air Sparging radius of influence. Air Sparging in conjunction with a low SVE induced vacuum is an effective remediation option. The accompanying photo shows an Air Sparging Pilot Test in progress. The on-board compressor pressurizes and filters the air and then injects it into the Air Sparge Well. The vacuum/pressures were monitored every half-hour to provide data for the calculation and projection of the Air Sparging and Soil Vapor Extraction (SVE) radius of influence. In this case, the injected air was mixed with Helium as a tracer gas. Air samples were taken from outlying monitoring wells as additional verification of the Air Sparging radius of influence. SVE was applied to the extraction well to remove the volatilized vapors of the chlorinated hydrocarbons of low concentrations which may be burned with the fuel in the internal combustion engine. Generally a vapor phase carbon canister is placed between the SVE well and the internal combustion engine. 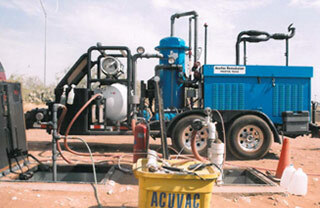 A pump test consists of installing a Redi-Flo 2, or higher volume well pump, in the extraction well. The Redi-Flo 2 pump is operated through a volume controller and has a maximum capacity of 8 to 10 gallons per minute. The higher volume pump has a capacity of 15 to 20 gpm and can be easily adjusted to lower volumes. The discharge is through a water volume meter and then directly into a tank or tank truck which remains on-site. If NAPL is present, interface probes are used to record the depth to groundwater and depth to NAPL. In-Situ data loggers are installed in the extraction well and other wells to record the groundwater recovery data.